Up-and-coming surfer Jordy Collins, en route to a professional career, boosts a big air (in surfer parlance) while riding the waves of the coast of California. Like his siblings, Jordy went out surfing with his Dad when only 2 years old, and the love of it never left him. Photo by Sam Moody. The kids went surfing with Dad as young as 2. For Justin (’18), a BYU exercise-science student; Joshua (’20), a missionary in the Czech Republic; Jordy, an up-and-coming “grom”—or young surfer; and Jill, a pint-sized yogini, surfing was as natural to them as walking. Jordy, 17, hopes to qualify for the World Surfing League—the pros. He’s already won big competitions, including the NSSA West Coast Regional/SW Conference Championship and the prestigious King of the Groms tournament in Brazil, and represented the USA in the International Surfing Association World Junior Surfing Championships in Portugal’s Azores islands in September. Yes, the Collinses are blond and handsome. But brewski-loving beach bums they are not. 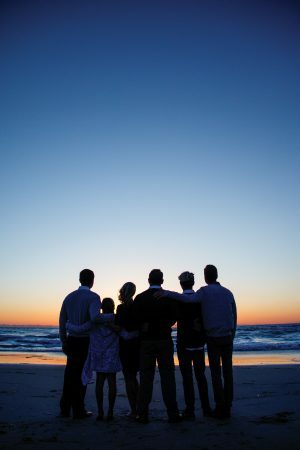 They are a close-knit, gospel-centered family that breaks molds in the worlds they inhabit. Jordy takes Sundays off and is conscientious about being an example to his fellow groms. The family has turned their home into a safe hangout for dozens of local kids, and their community beach parties (with son Josh as DJ) are known to be as fun as they are clean. As a yoga instructor, Tammy teaches the skill to youth and young girls who struggle with insecurity. Daren and the kids soon joined in. Now daughter Jill, 12, is the youngest licensed yoga teacher in the country. She had the idea of opening up a yoga program for young girls and teens and then made it happen. Finding family togetherness in entrepreneurship, the McBrides create a successful surfboard and skateboard business. An alum’s intricate moving sculptures are full of unexpected combinations.